Many of our clients, friends, and my family, especially pet owners, have asked when Pennsylvania legalized fireworks because most of us remember them being strictly forbidden (unless you “knew a guy”.) The answer is confusing. In Pennsylvania, there are two types of fireworks, Display and Consumer and both remain illegal. Display fireworks are those that you see during large shows. They are not available to the general public. Consumer fireworks are available to the public in many states but they are illegal to use or possess in Pennsylvania unless you are a dealer. 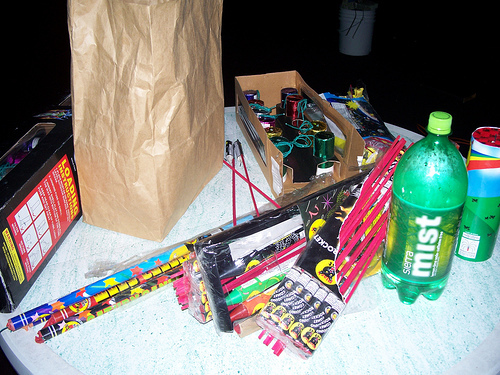 In the family of Consumer fireworks are other items that are considered sparkling devices, novelties and caps. The packaging of these items may say “fireworks” to entice consumers to buy them but they are not considered “Consumer Fireworks” under Pennsylvania law. While sparkling devices, novelties and caps used to be regulated and banned in many Pennsylvania municipalities, a 2004 law changed the prohibition against these items. Consumer Fireworks in Pennsylvania include firecrackers, bottle rockets, skyrockets, and Roman candles among others. Again, these items remain illegal. Use or possession of these items is a misdemeanor summary offense. Any person found guilty of selling these items commits a second degree misdemeanor offense. The following items are legal in Pennsylvania. Ground and hand-held sparkling devices produce a shower of sparks or a cloud of smoke, do not rise into the air or shoot projectiles into the air, and do not explode. They include: cylindrical fountain, cone fountain, illuminating torch, wheel, ground spinner, flitter sparkler, toy smoke device and wire sparkler. Novelties include small items such as party popper, snapper, toy smoke devices snakes / glow worms and wire sparklers.